New Beef Eco-Report: Pound-for-pound, beef produced with grains and growth hormones produces 40% less greenhouse gas emissions and saves two-thirds more land for nature compared to organic grass-fed beef. To reach these startling conclusions, analysts at the Hudson Institute’s Center for Global Food Issues used beef production models from Iowa State University’s Leopold Center for Sustainable Agriculture and greenhouse gas emissions estimates from the UN Intergovernmental Panel on Climate Change (UN IPCC). More than 95% of beef produced in the United States is raised on grain-based diets in feedlots, using supplemental growth hormones, both natural and synthetic. The report details the extensive human and environmental safety requirements for the use of supplemental hormones on feedlots, as well as the growing body of environmental monitoring studies showing no significant negative impacts from their use. Instead, the data show major environmental benefits of this production system: Saving 2/3rds more land for nature and producing 40% fewer greenhouse gas emissions per pound of beef produced. I perused the whole report found here (PDF) and found it very interesting. In most ways I can boil down what it says real quick. Beef produced in traditional feedlots using hormones, produces less greenhouse gas and takes fewer acres because they are alive for a shorter period of time. The hormones and grains cause them to reach a slaughter weight faster so the contribute less CO2 and methane to the environment than cattle that are naturally fed or organic since they need a longer time to reach slaughter wait. If you really think about this it makes sense. The use of growth hormones is one of the cheapest and easiest ways to get cattle to gain weight faster. I admit, I use them on my calves and I have no qualms with it. When I can receive more money for my cattle with no growth hormones in them than I receive after using growth hormones, I will consider stopping their use. The market isn't out there big enough yet though for me to do that. A lot of guys have stopped and made it work for them but I have not yet. Most of the people that are making it work are raising organic or natural beef. Some of the information in the report on growth hormones and what levels they are in the meat and environment are very interesting for those who get all freaked out by it. And don’t forget that our own bodies produce these same hormones every day in amounts a hundred times or more higher than found in beef. A pound of beef raised using estradiol contains approximately 15,000 times less of this hormone than the amount produced daily by the average man and about 9 million times less than the amount produced by a pregnant woman. The report goes on and on about this and really condenses the information down good as to how safe these growth hormones are. People can complain all they want about the agricultural system we have today which promotes feedlot raised cattle. If we want to economically feed people, these things are necessary. If you have enough money to chose a different way, more power to you. A lot of people don't have that choice. As with every thing in life, there are personal decisions to be made here. If the thought of growth hormones in your meat bothers you then go ahead and buy organic or natural beef. No skin off my nose. It will cost you more, I've seen the prices of this stuff. Remember though, It takes a lot more of earth's precious resources then to make that beef for you and they add more greenhouse gases to the atmosphere in the process. It's up to you to decide which is more important to you in the long run. I have to say I'm surprised you would fall for this, you seem a lot smarter. The CGFI and the Hudson Institute are shill propaganda groups whose only goal is to attack organic foods. This "study" was put out on a paid newswire, you or I could put out a study on this newswire that shows Santa Claus and Mother Teresa had a love child. They have bent their statistics to make a big fat lie. The whole premise of this being "healthier" and "greener" is that the cattle don't live as long, so don't produce as much manure, greenhouse gas etc. CALF A, (Feedlot calf) is born, grows to slaughter weight in a year, produces a year's worth of carbon dioxide and manure. CALF B (Organic range calf) is born, grows to slaughter weight in two years, produces two years' worth of carbon dioxide and manure. The only way this works out to be less damaging to the environment is if Monsanto or whoever else is bring CALF A to market takes a year off after the slaughter of CALF A and doesn't raise any more calves until CALF B is slaughtered. As you know, THEY DON'T. That's the whole point of feedlot cattle, get more of them raised and slaughtered quicker and make more money. They go get another calf, and raise it, and bring it to slaughter in a year, so they have raised two calves in the same time as the organic producer has raised one. So the whole premise is laughable. This is not even taking into account the fact which you must know very well that cows stacked in a small space are going to do a huge amount of damage to the grass (there won't be any in a feedlot, obviously), their manure is all going to need to be processed and treated rather than being a beneficial fertilizer to the land when spread over adequate range. Come on, I always thought you were a sensible guy, surely you of all people know that range-raised cattle on adequate space, where they aren't overgrazed, are better, healthier all around - for themselves, for consumers, for the environment - than cattle stacked like cordwood in a muddy dismal feedlot. When it sounds completely ridiculous, THAT's BECAUSE IT IS. Excuse me? Fall for what? I looked the Hudson Institute over a little and did come to the conclusion that they had an agenda, as most people do. For that reason I looked pretty hard at the paper before I commented on it. Now I won't say I checked all the facts in the paper but I randomly selected some and checked them and everything I checked looked good to me. My points on posting this were the good information on growth hormones presented in a very readable form. The information on how growth hormones and how much a person might get and how itr reacts in the enviroment was of great intrest to me since I use these hormones. I haven't seen such good information presented in a single spot in a long time. My second point on this was the economics of feeding people. Like I said, if you have the money to eat "natural" or "organinc" beef more power to you. There are a lot of people that can't afford to pay the prices these products command. If we were to raise all beef in the US on grass with no growth hormones, beef in the markets would cost about 3-4 times as much as today since it takes so much land to feed them that you wouldn't have as many cattle to slaughter. So, my thing is if we want to keep the price low enough for people to economically eat good protien, beef, the current system is working pretty well at doing that. Since each critter is alive a shorter period of time, they do put out less green house gas per critter whjether you like that or not, it's fact. I wouldn't go on to say feedlot cattle make more money than "natural" od "organic" as you do, it's just more efficient at providing food to feed people. I did find it interesting that you completely close your mind to the larger picture of economically feeding people. The way you are talking, food would be costing a lot more for people. I will tell you a little secert you may not be aware of. Most "natural" and "organic" beef you see in meat cases go through the same muddy, dismall feedlots that you so decry. They are just fed a different ration to make them qualify as "natural" or "organic" beef. There wates still have to be disposed of after having been run in a feedlot for most of thier lives. This idilic scene you have in your mind that these cattle are out on pasture grazing isn't how it is done no matter how hard you may wish it to be. There are a few that are, but most aren't. I appreciate your comments and hope I have managed to open your mind a little more to the facts of the cattle industry that you obviously aren't aware of. I do know what I am talking about and while I respect your right to speak your peace, you are making some wrong assumptions in your comment that I hope I have corrected and pointed out. Open your mind to other possibilities in this world. You will learn more. I too, read the entire report. I blog on both sides of these issues and I'm not sure how to feel about this report. It has lots of good statistics that address some of the perceived harm of traditional agricultural practices. However, it is definitely a paper with an agenda. The credibility of the facts presented is severely hampered by the blatant slant toward discrediting the grass-fed and natural movement. The big flaw I see is that they do not address the carbon benefit of the grasslands the cattle are grazing, nor do they address the carbon footprint of raising the grain that the cattle are fed. I suspect pasture-raised overall has a lower impact. I also suspect that beef prices would be much higher and less people able to afford beef if it all was grass-finished. The two types of production don't need to be antagonistic. There is a place for traditional and a place for alternative. I maybe should have made it clear in my post that I do feel the people that wrote the report had an agenda. The paper did have a lot of good information though in my opinion. My fault, I apologize. 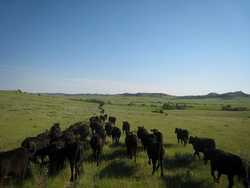 I have never been able to figure out the "carbon benefit" of grasslands versus grain. I also don't know how appropriate it is in this situation. Like I said, a lot organic beef is raised in feedlots and fed organic grains and feeds so I don't think there would be any "carbon benefit." I also understand a lot of the natural beef is raised in the minimum room necessary and fed harvested grass matter as there feed instead of grazing. The idyllic scene that people have in their minds of these cattle grazing on large pastures is just not how most of it is done. So how much "carbon benefits" there are is questionable. Trailing the yearlings to fresh pasture. There was nothing wrong with where they were at but I do need to save some grass there for later in the year so it was time to move them. taken 6/24/2008.